Posted in Bernie Sanders, Blogs & Social Media, Civil Liberties, Democrats, Donald Trump, Elizabeth Warren, Harry Reid, Health Care, Hillary Clinton, Iraq, Politics. Tags: Bernie Sanders, Democrats, Donald Trump, Harry Reid, Health Care Reform, Hillary Clinton, Iraq, Medicare, Our Revolution, Peter Daou, Wikileaks. RSS feed for comments on this post.. TrackBack URL. I can't for the life of me, understand, where you get these names, and why does everyone continues to push Elizabeth Warren, and Joe Biden. I don't know if it is because you leave in your well-fed liberal world, that you continually see the world through jaundiced glasses. There is a White Horse, candidate, who nobody mentions, and everyone is ignoring at their own peril, of finding their punditry in shambles, and a flood of egg-white on their faces. 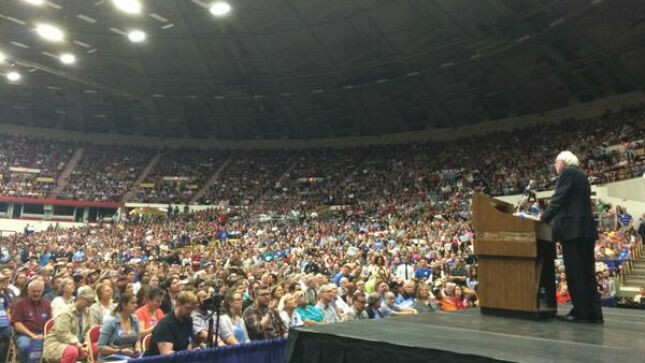 The candidate, that people love, simultaneously with Bernie Sanders, and will rise to the top of the heap because we support her as whole-heartedly as we did Bernie. Let me say her name and engrave it in your minds, and don't you forget it. The candidate a veteran of the Iraq war, beautiful, female, strong and powerful, her name is TULSI GABBARD (D-Hawaii) she resigned from the DNC while they were doing their shady number on Bernie. Tulsi Gabbard, if Bernie is on top of the ticket, we want her as our Vice President. The ground swell for Ms. Gabbard has turned into a tidal wave. She is the candidate the people want, should Bernie not run. And we want her as our vice-presidential candidate, should Bernie run, that, we dearly hope he will. So, not Elizabeth Warren, not Joe Biden, not Sherrod Brown, whoever he or she is, not Ike, or Nina Turner. Tulsi Gabbard is the one. Sanders/Gabbard in 2020. That has a beautiful sound to it. Don't you think? I thought Vox was doing well in even including Nina Turner. It is way to early to pic 2020 candidates, and I would like to know more about them before deciding. However, my but feeling right now would be to pick Gabbard over Turner because of foreign policy. I was disappointed in a recent interview with Turner in which she mentioned many views where she differed from mainstream Democrats, but did not even mention foreign policy. On the other hand, Gabbard has been stressing the issue. Of course this does not mean that Turner might not have foreign policy views which I would also agree with and she could easily redeem herself by speaking out on this in other interviews and statements. Sanders/Gabbard in 2020. Gabbard/Turner in future. First, the law suits and some experts, say Bernie won, but the primary was stolen by the corrupt DNC and Clinton Campaign. I personally talked to people who were devastated about being cheated out of voting. Some waiting for 4 hours to vote, only to be told they weren't on the rolls, or the machines weren't working, or they ran out of ballots, etc. Secondly, it was not only the issues that made people flock to Bernie, it was, and is, the image of non-corruption…that he can't be bought, He gave people hope. They are yearning for honest government instead of "everyone has a price". They wanted to to disprove "you can't run a campaign without corporate money" and the refusal of corporate money won people's hearts. Making three trips to Iowa to help kick off Bernie's 2016 campaign, it was inspiring to see this man putting so much energy into the cause. His charisma was so evident. He offered hope that you can have honest government. The DNC still doesn't get it. I left the party.